RAANJHANAA encompasses romance and myriad emotions most wonderfully, besides bravura performances and a popular musical score from the maestro. A film that touches the core of your heart. A film that's definitely worthy of a watch. Not to be missed! In Raanjhanaa, a guy from Benares tests his owns limits to the extent he’ll go for the girl he's been besotted by ever since he was a little boy. Endeavours that begin this early have a way of getting out of hand and exasperating. But Rai has Dhanush -- wonderful, tangible, indefatigable Dhanush, and the actor in his first Hindi film holds fort from start to finish. 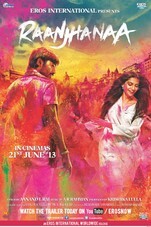 What this tells you: Raanjhanaa isn’t easy viewing. Kundan and Zoya aren’t easily likeable. They have flaws. They make mistakes. Blunders, really. But Rai shows them for what they are; he never paints a pretty picture. And this brutal honesty coupled with a commanding Dhanush is what works. Raanjhanaa, scripted by Tanu Weds Manu writer Himanshu Sharma, is a love story with a huge difference that benefits no end from a clutch of exceptional performances. The film defies the expectations of the audience at several crucial junctures and holds out absolutely no apologies for springing abrupt surprises. If you are among those that helped Yeh Jawaani Hai Deewani rake in all those crores at the box office, you owe it to yourself (and to the cause of popular Hindi cinema that entertains with more than just song and dance and star power) to vote for Raanjhanaa with your feet.